Jake’s pretty sure he could impress Dakota with his intelligence and skills, if only he could quit injuring him at every turn. The house Jake buys is in need of more than just a little TLC. The way the author describes it, sounds like it would have been less trouble to raze it and start over. But that isn’t what Jake saw when he walked through the front door. He saw himself. The house needed the attention and talents of someone who knew what they were doing. It needed someone who would look beyond the issues and see the potential. It needed Jake and Jake needed Dakota. This is a really sweet story. Jake and Dakota are likable characters and it was fun to watch their attraction grow at a steady simmer rather than boiling over at first glance. Dakota is very subtle, almost too subtle but that’s his character, in his way of showing Jake he’s interested. With the bits and pieces the author sprinkled in about who he was, it really made more sense than if he was suddenly all over Jake. They compliment one another. The story covers a good space of time. I mean, this relationship doesn’t start and culminate within a week or even a month. As Dakota puts it, he wanted to do it right. He really kind of woos Jake slowly and sweetly and it isn’t until later that Jake recognizes it. There could have been a word count restraint on this story but there were times that the telling outweighed the opportunity for showing. It doesn’t kill the story by any means but, I think it would have enhanced the flow and the reader involvement in the story to have been in the scene rather than reading over the scene. Some of the best moments are when they’re simply talking. The heat is there, too. The sweet way that Dakota has of touching Jake on his back or his leg, it fits the moments. Neither character is determined to be the alpha male and yet it made sense that Jake would defer to him. The secondary characters add to this story and round it out nicely. I would actually like to see if Matt and Jasper, together or separately, find their own match. This short is a HFN but it has real potential for a HEA. Ms.Harding has a nice voice in writing and she’s someone I’d read again. 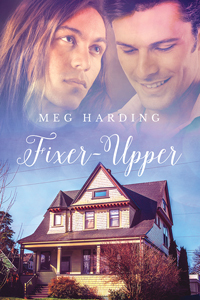 Readers looking for a quick feel good romance should give Fixer Upper a read.